The Hen Harrier Project team will always strive to make the right decision, however if an incorrect determination is made we welcome the opportunity to correct it. 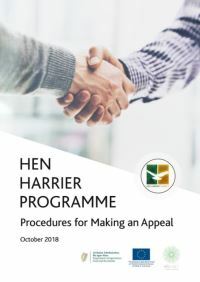 This guide provides information on what to do if you believe that the Hen Harrier Project team has made an incorrect determination in how they have dealt with your case. If you are not satisfied a decision the Project team have made, you can contact the Project Manager (in writing) and request a review of the decision. This request must be made within two months of the date that you were informed of the decision that you wish to have reviewed. The Project Manager will consider your case. If you are not satisfied with the review decision you can appeal it to the Appeals Commissioner. 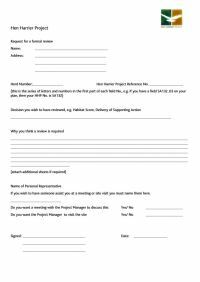 You can obtain an Appeal Request Form from link below or from your Hen Harrier Farm Advisor. When submitting an Appeal Request Form, please include the reasons why you believe the decision was in error with any other information that you consider relevant to your case. The Appeals Commissioner is appointed by the Steering Group for the Hen Harrier Project to decide on appeals made by Programme participants on decisions made by the Hen Harrier Project team. 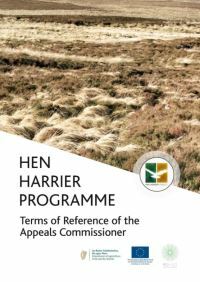 This document outlines the Terms of Reference of the Hen Harrier Programme Appeals Commissioner.